use the linx above to: take you to our facebook page; see photos of the farm and the farming; view a video of our operation, peruse press coverage and read testimonials from satisfied customers. Though in terms of turnover and financial impact the lavender way might be a small enterprise the amount of publicity that it has attracted in recent years is not. It seems to be an inspirational idea and media organisations small and large regularly find something uplifting and congratulatory to say about it and us. The local Xania TV station Kydon commissioned a program about the farm in 2007 and showed it 3 times in six months due to popular demand and although we do not ourselves take broadcast TV we are told that is still shown to this day. Only recently (2012) our local postman said that he had seen "the lavender lady on the television last week"
The renowned aromatherapists Andrea Butje and Christine Polynj visited us at the farm last year and Andrea wrote up her visit on her blog. 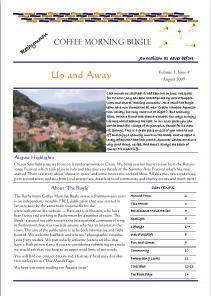 The only anglophone newspaper in the Rethymnon area is The Rethymnon Bugle which publishes monthly in print and online. They regularly cover innovative enterprises in the prefecture. They ran a very favourable article on the farm in 2009 having been captivated by the idea of it and eventually the reality of it. A pdf of the relevant issue can be downloaded by clicking here. The actual article is on page 5. Andrea Butje - CEO of Aromahead Institute, School of Essential Oil Studies: " I love, love, love your oils and am so glad I had the chance to visit you on Crete, in Greece!" Rachel Woud in Holland: " ... since the arrival of the parcel ... I have found that every morning I wake up Sara ... one her lavender cushions is always under her chin ... she finds that she sleeps really well with it... plus all her cuddly toys smell lovely too." Marian Bowen from NY writes : " ...our latest package arrived - "... the lavender wands are beautiful and the Makura is wonderful! ... the entire apartment smells of lavender!"